I'd intended to call this post weekend recap but time flies and here we are nearing the start of a new weekend. It's been a busy and exciting week or so here and being the introvert that I am, I needed to take a few days to recuperate. To recap just a little bit...last weekend was a big one - first, we celebrated the little guy's 12th birthday! A birthday is always special but this year, the excitement was heightened by the fact that I had planned a little surprise birthday party for him! It's nerve-wracking trying to pull off a surprise party even on a small scale - in this case, a small group of kids gathered at the house to spring the surprise, digging into some pizza and cake, followed by a trip to the bowling alley for a couple of games. On the heels of the birthday festivities, we celebrated Father's Day. These two events always converge and make for a busy weekend (not to mention plenty of prepping beforehand). Here's a little snapshot of our Sunday. It involved strolling around a car show in our town early in the morning. Then, we came home for brunch. I made one of my husband's favorites, a Dutch baby pancake. Even though we have it very often, he always requests it! For dinner, I made crab cakes, served over some cappellini with lemon and caper sauce. In between meals, I whipped up a little sweet treat for my husband (who has a major sweet tooth to match his personality), a simple berry crisp for one. It was thoroughly appreciated. I'm very lucky that my husband is a great person to cook and bake for! June is full of celebrations. It's both exhilarating and a little exhausting at the same time! My son just wrapped up 6th grade - another milestone we happily toasted. And by "toasted", I mean we had more cake! Now, things are quieting down and I'm ready to savor the slow days of summer! I'll leave you with this recipe for a single-serve berry crisp that I cobbled together (working off the recipes I've used for individual apple and pear crisps). It's very easy, using frozen mixed berries (which I had on hand after making the berry compote) that you don't even need to thaw in advance. For a single serving, I piled about a cup of the frozen mixed berries into a similar size ramekin (I wish I had a wider, slightly more shallow dish to use here). Toss the berries in a couple of teaspoons of sugar and cornstarch to sweeten and thicken the juice, along with a squeeze of lemon to perk things up. Then, pile on a streusel topping made with oats, flour, brown sugar, and butter. I say pile it on because everything will cook down in the oven. It takes a bit of time for the crisp to cook up. I was experimenting a bit with this "recipe" and starting baking the crisp at 350 degrees; I found that a hotter 375 degree oven worked better. It will likely take 30-40 minutes or so but use the time parameter as a loose benchmark because it's best to look for doneness in the form of the berry mixture bubbling. I think it's very important to make sure you have vanilla ice cream on hand to serve with your warm berry crisp! Because this dessert is a lot about contrasts...sweet and sharp, warm vs. cold, and crunch of the topping against the softened berries. The contrasts work really well together. My husband, who is a wonderful equal-opportunity dessert enthusiast, said "fruit desserts are so good" as he was eating this. I was glad he enjoyed it, though he seems to enjoy just about everything that comes out of the kitchen! And I'm really glad I got to celebrate two of my favorite people this past weekend! Make streusel topping: stir oats, flour, brown sugar, salt, cinnamon, and nutmeg together in a small bowl. Pour in the melted butter and, using your fingers, pinch ingredients together to make clumps. Set aside in the refrigerator until ready to use. In a bowl, toss frozen berries with the sugar, flour, and lemon juice. Transfer to a ramekin set on top of a baking sheet. Top with the prepared streusel. Bake, until berry mixture is bubbling and the topping is golden, about 30-40 minutes. Let cool slightly but serve warm, with a scoop of vanilla ice cream! A lot of happiness and celebrations and of course good food :-)) That dutch baby pancake looks great! Wow Monica - what a weekend! Your son will never forget that birthday. That is so special. My mom gave me two surprise parties - one on my 10th birthday and another for a baby shower. I was shocked for both and have never forgotten either one. I have a summer birthday too so it makes it nice to see school friends again. Glad you had a nice Father's Day and looks like you baked up some amazing desserts once again. We had family dinner but there was no surprise except when I told my husband he didn't have to help with the dishes :) I'm with Angie - your Dutch Baby looks perfect! Hi Tricia - thank you. I don't know why I didn't think of it before because a surprise party would probably have been perfect for turning 10! Your mom is a genius. I just thought it would be so nice to have a surprise party once and this is probably the last chance to do it while he might still enjoy it as a kid (they are growing up and getting teenage-ly very quickly!). I am so glad it worked and I hope he does remember it and is happy about it. Well done on pulling off the surprise! Love the sound of this little one person berry pot. And I love the idea of a berry crisp for one! Perfect for a craving! Have a wonderful weekend Monica!! GREAT JOB on organizing a surprise birthday party for your son and making the weekend special for your husband too. Love this berry crisp and I can imagine a warm mouthful , crumbly chewy soft with some vanilla ice cream.. Perfect! Sending birthday wishes to Jalen! Thank you so much, Bal! I really appreciate your well wishes. : ) It was an exciting weekend. I'm ready for a calmer one coming up! Aaw so happy the surprise birthday party for your little guy went well :) Happy Birthday to him! Sounds like he had so much fun and even better that he didn't expect it! 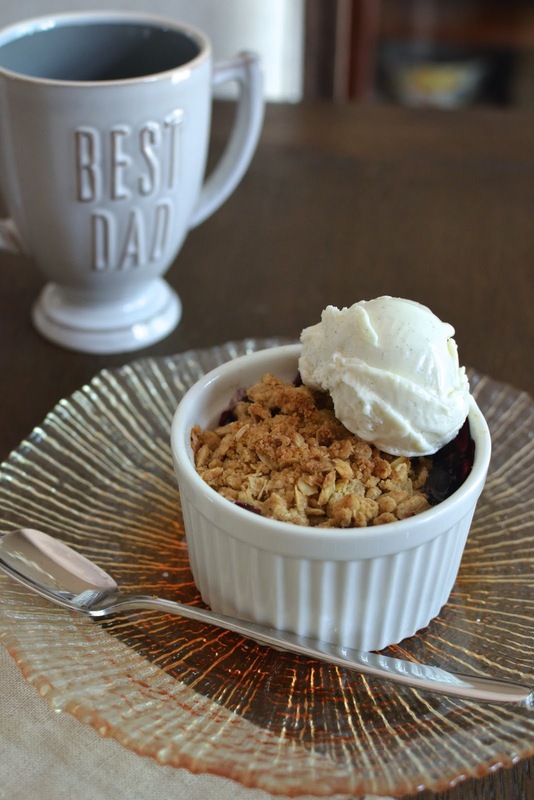 Love this berry crisp for one - that means no sharing required :) Glad it was an awesome Father's Day celebration as well - hope you get a chance to get some rest to recover this weekend! Hi Monica, I sure like the way you guys celebrate, also this berry crisp looks amazing, how nice of you to make this for your husband. What nice ways to celebrate holidays and special occassions! I love that you made your hubby a single serve dessert. And of course I'm drawn to that chocolate cake! A very happy special belated B-day! This single serving dessert could be lifesaver if you just need something a little sweet and don't want to make a huge batch. Love fruit crumbles this time of year. What a sweet surprise for your little man! I'm sure he will remember that day forever. You are such a lovely wife and Mummy. I can imagine all the planning and work behind 3 massive celebrations. You rock! It all looks AMAZING! One can hope! : ) I think he enjoyed it but he's not overly sentimental. Thanks for the encouragement, Sonali! What a beautiful party you threw for your son! And what a busy weekend for you! Wow! Such a wonderful way to celebrate. So glad l that you could plan a party for the little champ. Happy Birthday to him. I love how beautifully you could arrange everything. How sweet of you that you made single serving dessert for your husband. Many thanks, Anu. It's easy breezy now after those celebrations. Hope you're having a good week.